12:52 It has gotten dull. This trade may wind up being a pass. 11:33 this new high invalidates my down fractal chart in the CCT room. 11:02 getting hex pattern again-Mars, Saturn, Uranus, Moon+90 setting corners. 11:01 posted both my up and down fractals in the CCT Room. 10:41 rally was stopped by Moon T+090 elctric field flux line. Got move up to it after passing Moon T90 timeline. 10:33 a natural reaction here would be to think "My stop was just too close, I should resell." 10:06 posted my Fractal of Pi in the Certified Chaos Trader's Room. It is open to graduates of my 4 main courses. 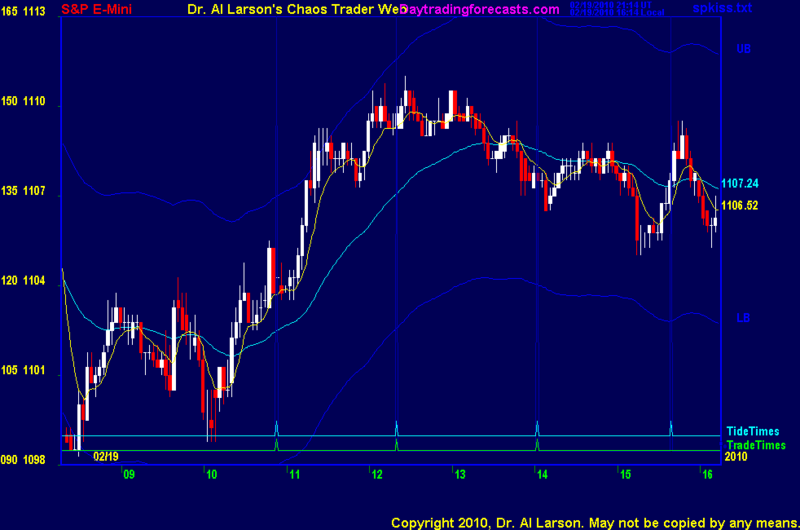 2/19/2010 12:52:52 PM MT emini:: whole hour and 2.25 range...something is definetly setting up. Either they collecting shorts and letting the retail players hold the longs or I'm completely wrong. 2/19/2010 12:49:04 PM MT jb:: Rainbow chart shows shorter moving average narrowing and wanting to crossover. 2/19/2010 11:15:25 AM MT emini:: I'm not expert....but if you can get good at this....then its much easier to make money. 2/19/2010 8:44:43 AM MT DP****:: Al, can you elaborate on how you chose 1099 as stop sell? Thank you. 2/19/2010 8:14:26 AM MT emini:: it may happen at 10:15 est! 2/19/2010 7:57:46 AM MT emini:: If I right, at 10.30 est this ES should drop....of course I could be wrong. The idea of pressure is the holy grail in trading, most important yet elusive. Any comments from the audience? 2/19/2010 7:28:04 AM MT UNI:: Good Morning All (from Hong Kong)!!! 2/19/2010 7:27:36 AM MT DP****:: Good morning everyone; Welcome to the big FRIDAY show. Good luck today. 2/19/2010 7:14:14 AM MT NSR:: Good Morning from Toronto! !